Are you tired of your Jeep lagging behind on the street or trail due to your worn out stock 4.0L engine? Having trouble climbing hills or towing a trailer? Check out the Golen Engine 4.6L Jeep Stroker Engine!! Over the course of the last 16 years, we have developed our 4.6L Jeep Stroker engine to be a direct bolt in for your 1991-2006 Jeep Wrangler, Jeep Cherokee or Jeep Grand Cherokee. Not only does this engine produce a strong 270hp but most importantly it produces 300 ft lbs of torque and has a super smooth idle to boot. 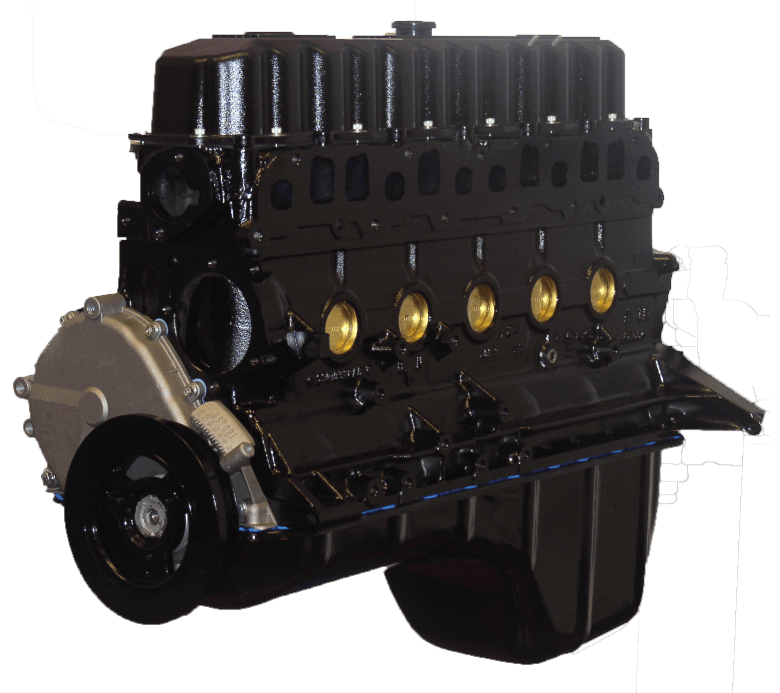 Originally built for owner Chad Golen’s personal Jeep this engine quickly became a fan favorite of Jeep owners across the country and Golen Engine has over 1400 in service today. The extra low-end torque really helps when your Jeep has larger tires, full-size spare and is loaded down with friends. Most customers have found this engine to get really good fuel economy but that will all depend on tire size, gear ratios and how heavy your right foot is. We find customers asking how the transmission and differentials hold up to the extra power? We found mostly through customers feedback that it works great with the stock transmission and differentials with no breakage reported. Using these quality brand names allows us to properly balance and blueprint the engine to ensure a long life and it comes with a Three Year Warranty with No Mileage Limit. We run each engine on our Super Flow Engine Dyno for a complete break in to ensure that it is running perfectly before it gets shipped to its new owner. We provide a Youtube video of your engine running and will email you the link along with PDF copies of the dyno sheets. Here are the benefits of the dyno service which comes standard with all of our Jeep engines. At this point, the engine is dressed and ready to reinstall back into your Jeep using your stock transmission, flywheel, and starter. Once installed you will need to ensure that you carefully connect all of the factory sensors and ground wires, a clean install will go along way when it comes to getting the engine up and running. Keep in mind that your new engine came full of Break-In Oil with a new oil filter and spark plugs installed and the engine has already been broken by Golen Engine so there are no special instructions upon startup just turn the key and let it idle. At this point, we recommend that you warm the engine up and check for any leaks and watch the gauges, if everything goes smoothly you would be ready for the first test drive. When you take the first drive with your new engine you will be looking for signs of a smooth running engine that operates normally, this will be a sign that everything was correct on the install. Let’s assume everything goes smooth (since it normally does), you would want to bring the Jeep back home and let the engine cool down for let’s say a half hour. Once cool we would like you to remove the spark plugs one at a time to check that they are clean, they can be any color other than Jet Black. If you have black spark plugs call Golen Engine Tech Support at 1-800-591-9171 Ext 2 before driving your Jeep any further. At this point, you are ready to drive your Jeep on a daily basis and there is no special break-in driving instructions since we did the break-in at our shop. Maintaining your new engine will be quite easy for we recommend normal oil changes every 3000 miles using a conventional 10w40 based oil and a name brand oil filter such as the Wix Brand or Napa #1085 (which is made by Wix). It is not mandatory to run a Zinc additive in your oil but it is a good insurance policy that will only cost you $10 per an oil change. The Zinc adds an extra layer of lubrication that helps all engines and you can purchase it in a small additive bottle or there are many oils that already have higher Zinc levels in them such as the Driven Hot Rod oils. Spark plugs we like to change every 10,000 miles and we use one step colder than stock Champion plugs #430 which work quite well and are very affordable. As for fuel, this engine performs the best on 89 octane or higher fuels and these fuels will help it last for a very long time. You can pretty much drive your Jeep any way you would like for your new 4.6L Stroker Engine is very strong and can handle just about anything that you throw at it. We do recommend keeping it below the factory set rev limiter which is 5200 rpm, bouncing off the rev limiter is not good for any engine. Enjoy your new engine and please feel free to send us any pictures of your Jeep in action and we can put them up on our Facebook and Instagram pages.